I have come up with solution to the drunken yobbery, that plagues Britain's town centres each weekend. As it is relevant to the entire country, not just Croydon, I have posted it today on Ken's Blue Blog. Feel free to post your own views, on The Forum. I have received a good suggestion from someone, about what to do with the rioting scum bags from Sunday. The suggestion is to put them to work on regenerating the canals. Good idea in my view. Other suggestions are very welcome, please feel free to post them publicly on the Forum message board. I understand that there was a mini riot in Croydon last night. It seems that 400 "football fans" (drunken scum bags to you and me), fed up with England's performance in Euro 2004, decided to have a fight with the police. Missiles were thrown, and cars overturned. Now that these morons have sobered up, let us round them up and put them to work. To start with they can clean up the mess they made last night, then they can be put to work regenerating the decaying and rotting areas in the borough of Croydon. Our local paper, The Croydon Guardian, has given my recent correspondence with Prince Charles a mention; their article can be viewed here Prince shares Ken's concern at town decay. 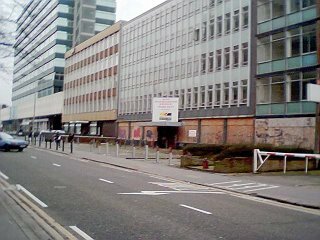 I received an email today, from a fellow Croydon resident, congratulating me on the site; and asking if I knew of any voluntary bodies who were working on improving these, and other, derelict areas in Croydon. I have to say that I don't. However, I will have a look around; and, if I find any, will post their details on this site. In the meantime, if anyone out there in cyberspace knows details about any organisations that may fall into this category; please email me, and I will post the details here. I see that the demolition squad have moved in on Trafalgar House. As you can see it is such an attractive building! This is good news, at least the crumbling eyesore will be knocked down. However, I hope that something will be put in its place soon. Otherwise the citizens of Croydon will have to endure yet more wasteland blighting the landscape.